JoJo’s Bizarre Adventure is such a strange thing, even by shonen battle series standards. We’re currently approaching episode 44 of Part III: Stardust Crusaders, the second half of which is called Battle in Egypt, and, well, that’s about as straightforward a title as one could ask for on top of the already dead-on series title. 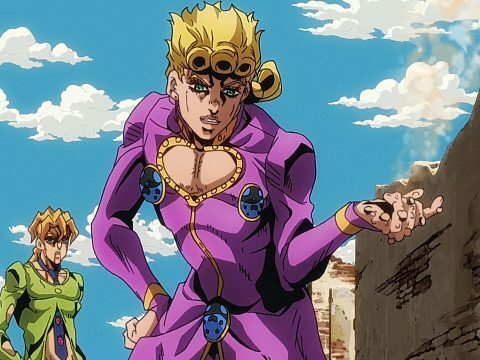 Hirohiko Araki knows how to craft an appropriately bizarre adventure, but JoJo’s is at its best when it’s not about straight-up fighting. Battle in Egypt kicks off with the introduction of Iggy, a kind of cute but mostly repellent Boston Terrier with a penchant for coffee-flavored gum and an utter disregard for the plight of our heroes. Nevertheless he’s along for the ride, and he quickly becomes another source of comic relief in an already goofy as hell show. When he’s not snapping at Polnareff or farting in Joseph Joestar’s face, he can usually be found conveniently bumping into someone or appearing at just the right moment to inadvertently knock an enemy out of the way. Any given episode of Battle in Egypt can come off as a cacophony of manly yelling and throat-scorching shouts of “OH MY GOD” to someone in earshot, but there’s still plenty of tension in the air when things get serious. 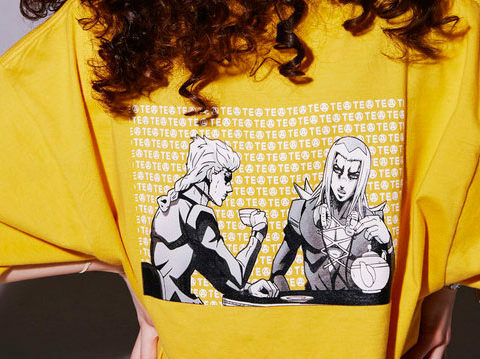 Sure, you never really think any of our heroes are going to die at this point, especially after Avdol already survived a brush with death once. (We’ll see what happens with him next; I haven’t read all the manga!) Hand-to-hand-to-foot-to-knee combat isn’t something one should necessarily tune into JoJo‘s for, though. Rather, it’s the unconventional showdowns that keep Battle in Egypt on top of the rotation week after week. One battle has them fighting an invisible water-based Stand in the middle of the blazing desert. The face-off against D’Arby the Gambler is an instant classic, with high stakes betting making it seem more like a couple episodes of Kaiji. Then we have the return of the gunslinger Hol Horse, who learns to trust in the funny-book prophecies of Mondatta, the little kid whose name was changed from Boingo to another less litigious rock reference for the English version. And then, finally, after 12 episodes, we get a solid character beat for Iggy, who is forced to go animal-versus-animal in his battle with Pet Shop, the eagle-eyed, icy-taloned guardian of Dio’s mansion. 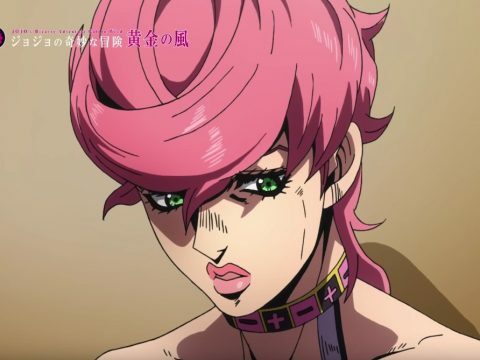 After that D’Arby’s younger brother, D’Arby the Player, throws Jotaro, Joseph, and Kakyoin into a situation a little show called Nick Arcade would have referred to as a VIDEO CHALLENGE. This is another great example of the unconventional fights that work best, as Kakyoin shows his skill at an F-Zero style racer before Jotaro has to give a console baseball game the ol’ college try. 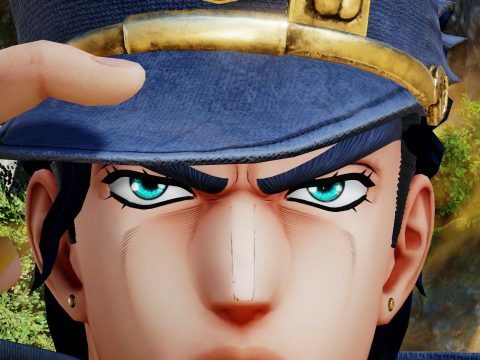 JoJo’s Bizarre Adventure: Stardust Crusaders – Battle in Egypt has its ups and downs, and I’m positive if it were any other show we’d be making fun of the animation way more than we are. 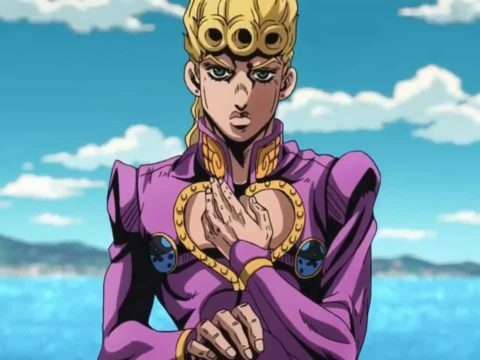 You’ve also probably heard about some of the especially stupid censorship, like the pointless attempts at blacking out a cigarette in Jotaro’s mouth even though you can see the smoke AND the cherry. The important thing, though, is that it’s a blast more often than not, and catching up with the series in a marathon binge is one of anime’s great pleasures. 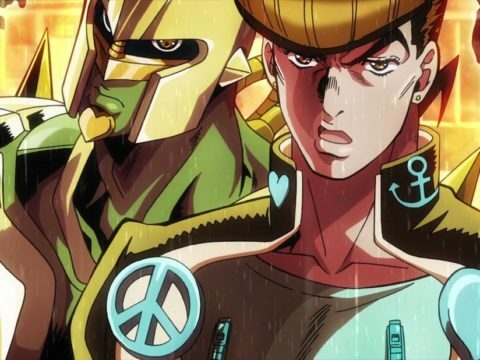 There are just a handful of episodes left before we bid Stardust Crusaders a fond farewell—and hopefully David Production will eventually be adapting Part IV—so now’s as good a time as any to get into the oddball action. 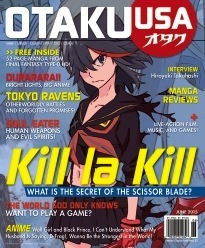 For more great anime features and reviews, pick up the June 2015 issue of Otaku USA at your local bookstore, order it from our online store, or subscribe to get every issue!